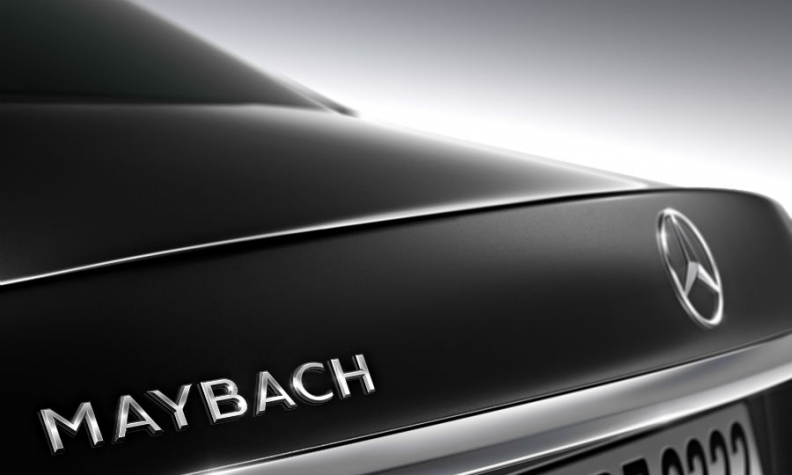 The Maybach logo is seen in this teaser picture released by Daimler. SINDELFINGEN, Germany -- Daimler will revive its Maybach ultraluxury marque as a subbrand with three variants of its flagship S-class sedan, including a version aimed at Chinese buyers, but the company ruled out a Maybach SUV for now. Daimler said it will unveil the Mercedes-Maybach S 600 at the Los Angeles and Guangzhou auto shows later this month. The sedan has a 6.0-liter V-12 twin-turbocharged gasoline engine capable of producing 530 hp. It will be joined by the Mercedes-Maybach 500 with a V-8 engine and the Mercedes-Maybach S 400 4MATIC with a 3.0-liter V-6 and all-wheel drive. This version has been designed to appeal to Chinese buyers looking avoid punitive taxes. Media reports have said that Mercedes is developing a Maybach SUV based on the GL. Mercedes sales chief Ola Kaellenius said: "I don’t want to categorically rule anything out, but at this stage we have no plans for it [a Maybach SUV]." Daimler also has no plans for Maybach hybrids but executives did not rule out adding hybrid variants in the future. Daimler scrapped the Maybach brand in 2012 because of disappointing sales. Maybach deliveries peaked at about 600 cars in 2003, while its rivals, Rolls-Royce and Bentley, have gone on to post sales records. Kaellenius told reporters here on Tuesday that Maybach will be reborn as a subbrand offering luxury and individualization for status-oriented buyers with the most discriminating tastes. When asked whether the S 600 would compete with ultraluxury brands Rolls-Royce and Bentley, Kaellenius said: “I am completely convinced that we can win customers in the highest segment." Kaellenius said the Mercedes-Maybach S 600 will cost less than Maybach sedans sold between 2002 and 2012. Prices will be disclosed on Dec. 18. The sedan “will be positioned in a price segment below the earlier Maybachs with a spaciousness and driving performance that fulfills the ultimate demands,” he said. Maybachs will have "lavishly designed" interiors and more customization options, Daimler says. He said Mercedes-Maybach sales would be “significantly above” previous volumes of the old Maybach, of which more than 3,000 were built over its 10-year lifespan. There are currently no plans to expand Maybach into lower segments such as the E class, which is positioned immediately below the S class. 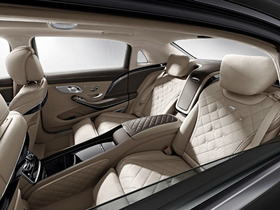 The Maybach S 600 has a wheelbase stretched by 200mm to give it a roomier interior. Some of the features that distinguish it from the standard-production models include extra spaciousness, special seats and lavishly designed, prestigious interiors offering extensive scope for individualization, Daimler said. The sedan also offers the quietest interior in the rear of the passenger cabin even when matched against rival models from Rolls-Royce and Bentley, Daimler said. 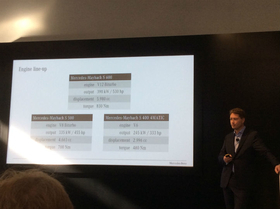 Mercedes sales chief Ola Kaellenius explains the new Maybach variants to reporters. Mercedes has sold more than 100,000 units of the S-class models since the start of this year, which Kaellenius said was roughly the volume of the Audi A8 and BMW 7 series combined. As an independent brand, Maybach -- named after an early collaborator of Gottlieb Daimler, one of the automaker's founders -- failed to mount a serious challenge for ultraluxury buyers because it lacked global name recognition. "It's a much better fit to reactivate Maybach as a subbrand of the S class than to try to artificially build up a brand history," said Daniel Schwarz, an analyst with Commerzbank in Frankfurt. "The S class is already a strong brand and can be leveraged even further."